Description:2 Dozen stunning red roses in a hand-tied bouquet are artfully presented in a chic rectangular vase. Luxury crimson ribbons add a touch of romance to send your special message. 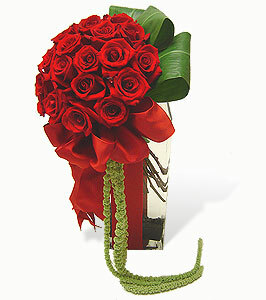 Arrangement Details: Two dozen red rose bouquet in a tall rectangular glass. Accessorized with ribbons, ti leaves and black gem stones. I have been using this florist every Monday for about a year a year and a half...staff is WONDERFUL delivery person is awesome to my girl who receives the flowers weekly flowers are out of this world and ALWAYS fresh...usually last through the week through the weekend and on Monday she feels guilty throwing out still good looking flowers! Would highly recommend them...and ask them about their weekly special...I have been doing it for my girl since we met...and you cannot believe the BANG I get for my buck! Girls at work always run down to see my girls weekly flowers....and no matter what they ooooh and aweeee over them and say how terrific I am! Well worth the price...and the florist worked with me to ensure it was AFFORDABLE and easy...they even call if I forget the weekly card message! GUYS you have to put your girlfriends...wives...or significant other on weekly delivery!